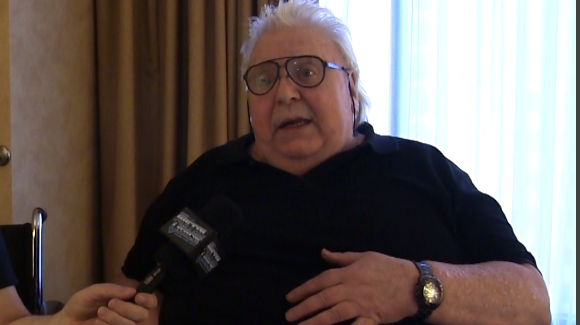 Lee Kerslake talks receiving Platinum Discs from Ozzy, "I broke down and cried"
Jimmy Kay from The Metal Voice (https://www.facebook.com/themetalvoice) spoke to former Ozzy Drummer Lee Kerslake in Anaheim California at this years annual Hall of Heavy Metal History Gala Jan 23 2019, where Kerslake was inducted and presented the two platinum Ozzy Discs. "The phone rang about month and a half ago, it was Pat Guesaldo CEO of the Hall of Heavy Metal History and he said we would like to induct you into the Hall. Pat said we would love to have you in California for the Gala but I said I am on a pension and I can't afford it. Pat then said what if we take care of it for you . Then I said without sounding like a Deva I can't travel coach cause I have arthritis and bone cancer. Then Pat said no worries we are going to fly you first class. I nearly broke down and cried. I finally got to California, the flight took 10 hours and when I landed I said to myself, I MADE IT, I haven't done this for 22 years." " We were filming me packing for California on my upcoming autobiography documentary and then my manager came in and said I have a surprise delivery for you and he brought in these two big boxes and they were the two platinum Ozzy discs, it was a crying moment. We finally buried the hatchet between the Osbournes and myself. I respect Sharon and I love Ozzy to bits. Ozzy also sent me back a beautiful letter hand written." "The cancer has come back unfortunately, it has come back with a vengeance but I am not worried about it at the moment I am enjoying this moment and all the love. I am having a great time. My doctor told me before I left they will be putting me on a new drug and I am hopeful."